People. That's what it all comes down to. At Heinmiller Heating & Cooling, we are consciously aware that every job we do has an affect on the lives of people in our community. Making your home or business a comfortable haven throughout the extreme conditions of Florida weather. Controlling humidity. Improving indoor air quality. Maximizing the overall effectiveness and equipment life of the system components while minimizing the amount you spend on energy. No project is the same. Every job commands our full attention and the application of a level of experience that only decades in business can deliver. That's why people who expect polite, attentive and expert service choose Heinmiller Heating & Cooling year after year. The quality and value of the past meets the technical advancements of the day at Heinmiller Heating & Cooling. 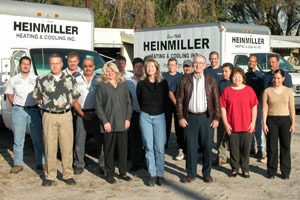 Spanning three generations of family ownership, Heinmiller is Central Florida's most established name in interior comfort. Our family and staff invite you to experience for yourself how old fashioned ethics and innovative solutions can benefit you.